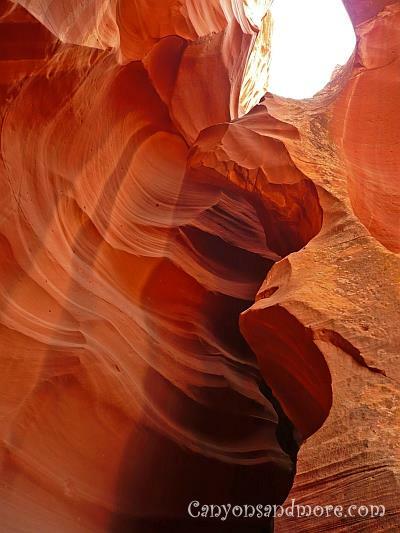 Page, Arizona was the starting point to go see the Antelope Canyon. 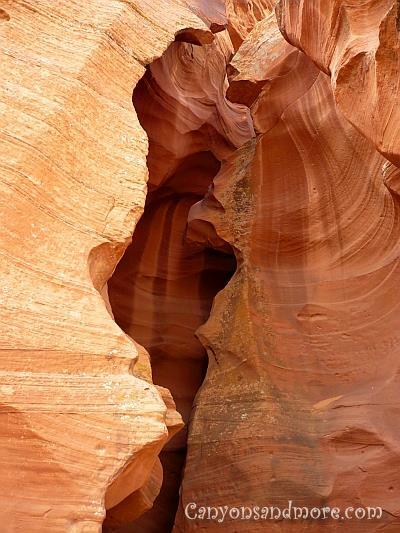 But you do not have the freedoms you have when visiting other canyons because the Antelope Canyons are in the middle of a Navajo Reservation and it is required to go with a guided tour group there. When approaching the area, you would never recognize the entrance to this gorgeous wonder of nature. It blends in with the area around it and there is nothing spectacular to it. Actually, it is incredible that it was ever even found. But once inside, you dive into a world of color and texture and wish you would never have to leave it again. 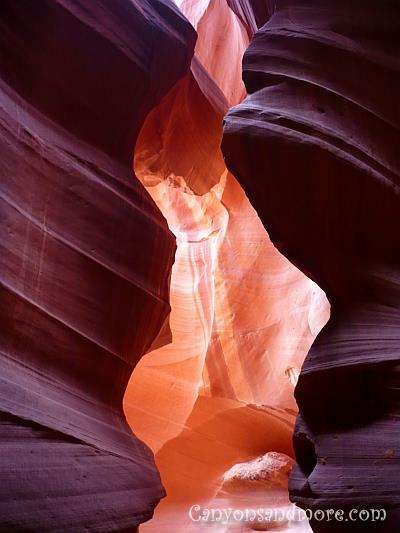 The image above shows how it looks once you are inside the Antelope Canyons. From the outside of the canyons you would never suspect such a beautiful display of beauty within the walls. There are shops in Page where you have to go to book the tour. The tour costed 32 dollars per person as of August 2008. It will most likely cost more now but that is just to give you a ball park figure so you know what to expect. 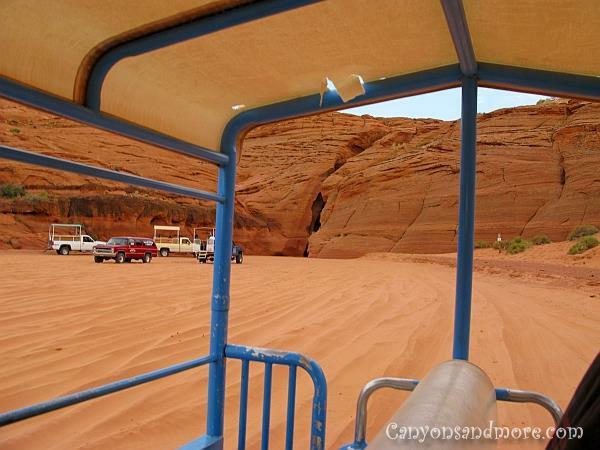 After paying the fees, you have to wait for the next pick-up truck that will take you to the Upper Antelope Canyons. 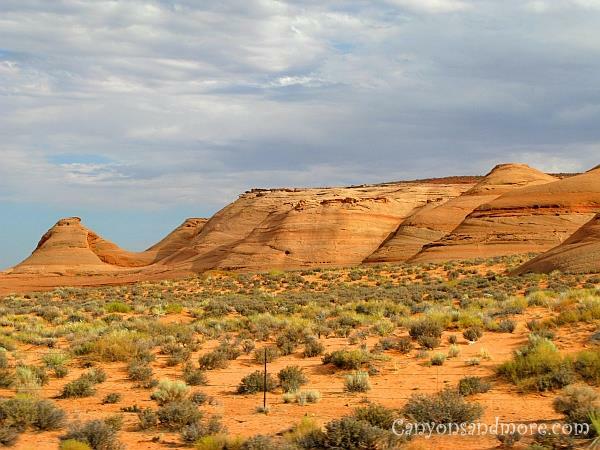 This image shows the landscape of the journey between Page and the Canyons. The drive to the Antelope Canyons from Page was very bumpy once we left the paved road, because of the sandy desert like landscape. But it was fun and adventerous at the same time as the truck got stuck more than once in the hot sand. After arriving, the group walked to the front entrance to the canyons. Looking at the outside, one would never believe how fantastic it looks on the inside. When we arrived, our tour guide explained the geological history of the area and how thousands of years of water flooding these canyons carved these extraordinary smooth walls to that what they are today. its final appearance. She also told stories about the days when these canyons were easily accesable by the general public. But teenagers had parties here and vandalized and sprayed grafitti onto the canyon walls. Eventually the state took over, sandblasted the grafitti away and made it into a what it is today. Even in the late afternoon hours the colors and soft texture were simply gorgeous to look at. The tour guide said that 11:30 a.m. is the best time of the day to come to these canyons. Even if that was true, the late afternoon hours when we were there were still magnificent. Depending on the time of day, the sun will beam its light in different angles into the crevaces of the canyon. It is an everchanging gorgeous circle of color, texture and shadows. Within a short time, the same place in the canyon can appear totally different than it did before. Don’t forget to pack a camera that makes good low light pictures. It is no so bright inside the canyons. You will not have too much time, though, to make pictures. 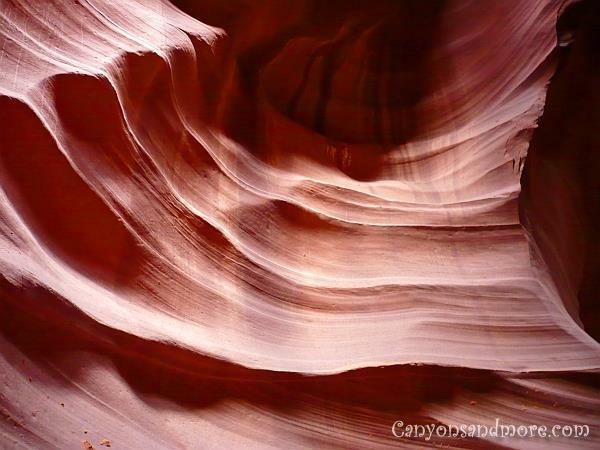 The surface of the rock at Antelope Canyon was soft and smooth. 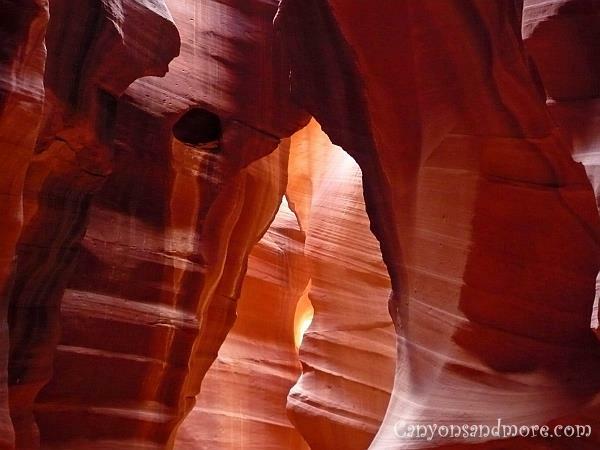 Each new step takes the group deeper into these canyons and we all felt so awe inspired at the sight. 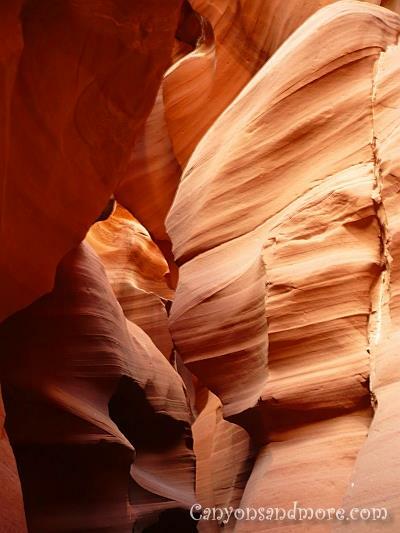 So many moods were created by the play of light and darkness on the surface of the canyon walls, which created different effects. 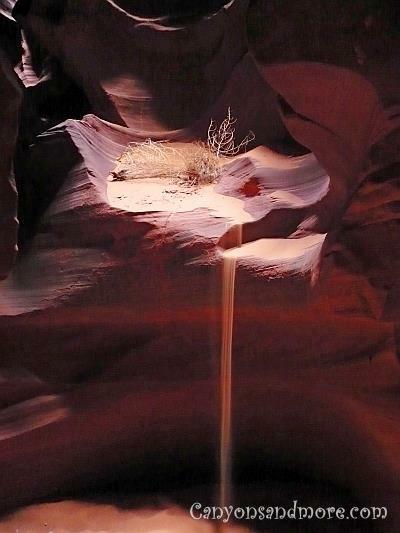 At one point, sand from the desert above sprinkled lightly into the canyon and made its way down to the final level. It was like watching an hourglass. 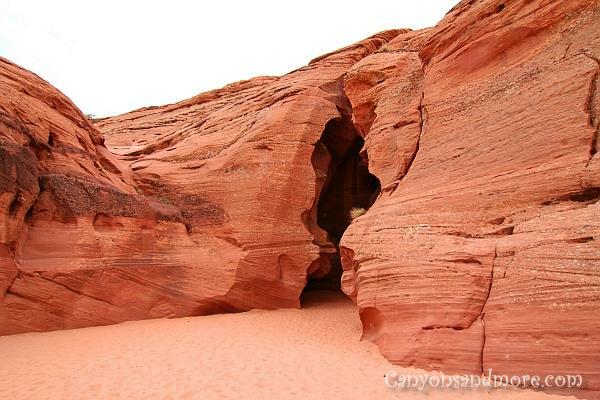 After going through the Antelope Canyons this is how the back entrance looked like. About like the front and just as inconspicuous. After viewing it, we walked back through the caves to the front entrance. The whole tour seemed to have only taken 20 minutes. The tour allowed time for taking pictures but it still seemed to go too fast to really absorb the beauty of these canyons. It would have been a lot more fun to be able to stay a while and discover the area more. Afterwards we all got on the truck again and headed back towards the office.